Pinay Guerrilleras might come as a shock to those already familiar with traditional World War II narratives regarding the war in the Pacific, which typically focus on the efforts of U.S. forces to defeat the Japanese. In that story, the Philippines plays a minor role as one of the first U.S. possessions conquered by the Japanese. While we sometimes hear about how Filipinos resisted the Japanese, we are rarely told the specifics. What is fascinating about this book is that it sheds light not only on the Philippine resistance, which itself is rarely covered, but on the women who spearheaded that resistance, who have been overlooked to an even greater extent. The book is broken into three parts, each of which looks at different groups of women and how they contributed to the resistance. Salinas focuses first on the women who fought for and led the Hukbalahap Guerrillas, which were probably the most politically radical of the resistance fighters. After the Japanese were defeated, Huk women continued to fight to make the Philippines a more democratic nation. The next part of the book focuses on the "Glamorous Guerrilleras." These were Filipina mestizas who led parts of the resistance effort, and are largely remembered more for their beauty than their role as resistance leaders, a problem Salinas amends by detailing how their actions were crucial in destabilizing the Japanese occupation. The "Glamorous Guerrilleras" have been largely forgotten primarily because their successes as leaders have been attributed to men. Indeed, Salinas uses examples from film to show how popular culture relegated Filipina mestizas to support roles within the resistance, rather than highlighting them as the figureheads they were. In these films, men get all of the credit, while women serve primarily as love interests. Salinas deserves credit for bringing the true history of these women to light. Lastly, the book covers guerrilleras who served in the resistance and then immigrated to the United States, many of whom started families soon after they arrived. Interviewing some of these women herself, Salinas recovers their stories and uses their experiences within the resistance to reveal how Filipinas played a crucial role in fighting the Japanese during World War II. But Salinas also highlights these women to show how serving in the resistance hardened Filipinas immigrating to the United States after World War II. Their experience fighting the Japanese made them stronger, giving them the fortitude to persevere through the trials and tribulations of being first generation immigrants within the United States. 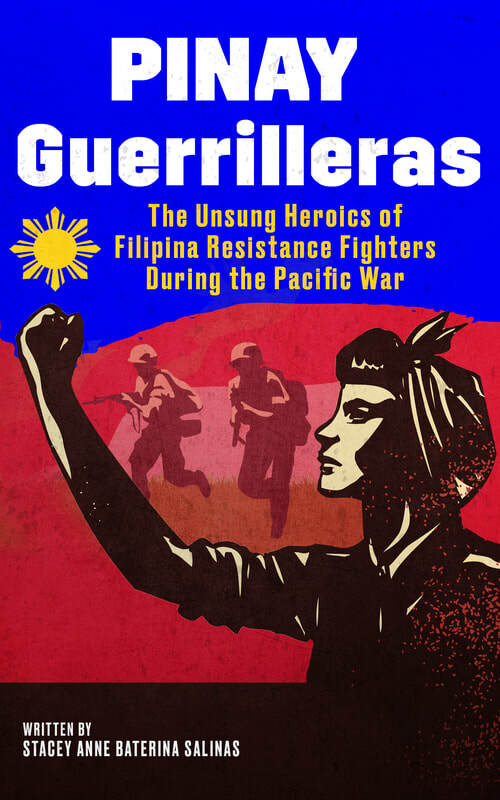 Pinay Guerrilleras is an important book that uncovers the role that Filipinas played in the Philippine resistance against the Japanese occupation. Not only does it re-contextualize the story of the Pacific War, but it also calls to our attention the stories of women guerrillas whose efforts have never before been documented. For this, Salinas should be applauded.